Early in the morning of May 1, 1866, fires damaged several African American churches in Petersburg, including the Sunday school building adjacent to one of them. Many white Virginians feared that the schools would become hotbeds of radical Republicanism. 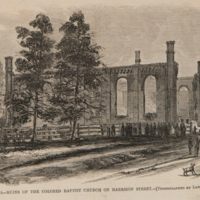 “Fires at Petersburg, Virginia-Ruins of the Colored Baptist Church of Harrison Street,” Remaking Virginia: Transformation Through Emancipation, accessed April 22, 2019, http://www.virginiamemory.com/online-exhibitions/items/show/582.